Hello! 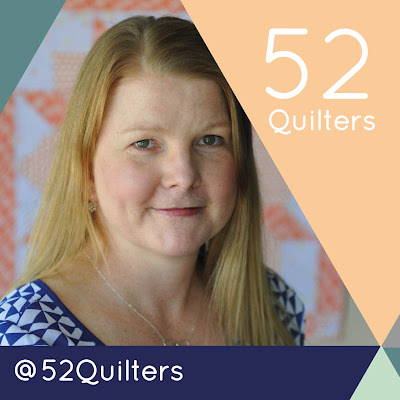 What an honour to be chosen as one of 2016's 52 Quilters! A little about me: I live in Kitchener, a mid-sized city in southern Ontario, Canada. Turns out that's the perfect spot for the two great passions in my life - quilting and cycling. My region with its Mennonite background has a very long and strong quilting tradition. And its endless rolling country roads are where I like to cycle. If I'm not doing one, I'm most likely doing the other! My background: Crafting has been a part of my life since I was a child. Back then it was mostly cross-stitch and then later beadwork. My mom is a very talented crafter, as was my grandmother, so I grew up surrounded by crafts. My mother has been quilting for as long as I remember, but it was only about five years or so ago that I decided to give it a try. But it was joining Instagram a few years ago that really kicked my quilting into high gear! Instagram is endless inspiration and the quilting community there is just so fabulous and encouraging. It really has been a blessing in my life, not just for quilting ideas but I've met so many wonderful people and friends who just happen to share my love of sewing and quilting. My style: I guess it's best to call myself a modern quilter, but I also appreciate and often use traditional blocks. Bright, bold colours are my favourite and generally patchwork over paper piecing. When it comes to quilting, I'm straightline all the way! I am totally in awe of people who free-motion quilt and I've given it a go, but I always gravitate toward orderly patterned lines. Spending hours and hours quilting straight lines is very relaxing for me. So far I've only made a few larger quilts, including Tula Pink's butterfly quilt. That felt like an amazing accomplishment! For now I'm happy making smaller items like minis and pillows so I can try out an idea, then move onto the next one. My most favourite part of quilting - giving what I make away! My week: For my week on 52 Quilters, I will share on the blog a tutorial for a simple but striking quilt block. I hope people will take the idea and have fun with it! I'll also have a pattern for a block I've used to make a few pretty pillows. I also want to encourage some quilting discussion on Instagram, including sharing favourite tips. And there will be a little giveaway! But I want to ask you ... Is there anything you'd like from my week as host?